Democracy as we knew it in Fiji ended on the stroke of 10 on May 14, 1987. The chiming of the clock at Government buildings was the signal for the then Colonel Sitiveni Rabuka and his men, to storm parliament and kidnap the democratically elected Government of Dr Timoci Bavadra. Every journalist has a defining moment in their career. My claim to fame was this one. I broke the news to the world. But I almost missed out on being a witness to one of the most momentous moments that changed the course of Fiji’s history. At the time I was a cocky 26-year-old editor of Fiji’s first commercial radio station FM96. I say that because we were redefining radio from the drab drivel of the government run stations at the time. We pushed the boundaries by starting hourly news bulletins with a three man new team, against the vast resources of the Government broadcaster. They said it couldn’t be done because Fiji was too small and many on the sideline were watching, expecting us to fall flat on our faces. With this back drop of having much to prove, I was sitting at my desk on that fateful day exploring options of how to generate fresh news for the top of the hour. The tedium of a parliamentary session, trying to make sense of what our elected representatives were saying was unappealing, but I decided was a necessary evil. So I ended up at the press gallery, bored silly, and because I had skipped breakfast hunger pains were setting in. This was the pre-mobile phone era where land lines were fiercely guarded and faxes ruled. There was just one phone next to the press gallery where Hansard recording were taking place. At 10am when the clock started chiming, I decided I had enough and got up to leave, when I noticed Rabuka striding through the parliamentary chamber towards the Speaker. My curiosity peaked and I decided breakfast could wait. Rabuka was not in uniform, he was dressed smartly, coat and tie and a sulu, no indication of what’s to come. Shortly after balaclava clad men, dressed in army fatigues, brandishing pistols barged into parliament positioned themselves behind Government MPs. I remember thinking this is an unusual exercise for the army to conduct, but than my journalistic instincts kicked in and I started counting heads and observing details. Among those were Rabuka instructing Government parliamentarians to follow his men out of parliament. Prime Minister Dr Timoci Bavadra leaning back in his chair, rolling his eyes upwards, slapping his table with both hand, pushing himself up in defiance. A soldier, placing a gun in his back and ordering him to lead the way out of parliament. Other Government MPs roughly pulled out of their seats and shoved along at gun point, some stumbling, others leaning on each other for support, in confusion. Fiji Broadcasting Corporation journalist Francis Herman (later became chief executive of FBC) and I looked at each other and it dawned at us at the same time that this is a coup. Both of us scrambled for the only phone. He got there first. The nearest phone for me was the Ministry of Information building next door. I went charging down the gallery stairs. The old parliamentary entrance had bat wing doors, like the cowboy movies. I burst through that and came to a screeching halt with an AK 42 riffle in my stomach and a balaclava clad soldier at the end of it wanting to know what the #@#* I was doing. Like any B grade movie I immediately put my hand up, shaking my note pad, as if that was going to be any help, shouting “I’m a reporter, I’m a reporter”. He obviously had more pressing issues to deal with and told me to “get the #@#* out of here”. I raced into the Ministry of information building, shouting give me a phone, any phone now. The Director of Information at that time was Peter Thompson. He wanted to know what the urgency was. While dialling the radio station, I said there had been a coup. He and a few others around at the time laughed and said yeah right. By that time I had been put through to the studio, I told the announcer to fade the music with breaking news. I started my report saying there has been a military take over and gave details of Rabuka and his men storming parliament and taking Government MP’s hostage. Peter Thompson heard the report in stunned silence and finally said “well they are going to be here wanting to put out a press release”. One of the Information Ministry reporters grabbed the phone from me and said I can’t use it anymore. Francis Herman should have broken the biggest story in Fiji’s history. He later told me he was trying to convince his superiors that there had been a coup, but no one would believe him. I had no such problems, I was the editor, no one was going to argue with me. So I waited for the first news release by Rabuka, officially telling Fiji citizens, their lives had changed for ever. By that time the building was surrounded by armed soldiers. I grabbed the first the copy out of the printer and jumped through a window, my only way out of the building. I ran to the road to flag down a car to get to the radio station as soon as possible, to get the official statement to air. The first vehicle to come along was a police van which I flagged down. Luckily I knew the officers from my days doing the police round. They said hop in and they will drop me and started asking what was the hurry . I said there had been coup. Their response “Oh yeah, so what happened”. I said “you know a coup, don’t know what the hell’s going to happen now”. They looked at me blankly so I explained to them the military has taken over, guns are involved, elected government is under arrest. It suddenly dawned on them what a coup was, they both looked at each other and said to me “we can’t take you to FM96 anymore we’ll drop you at the nearest taxi stand”. By that time the military had stormed the Fiji Sun, The Fiji Time and FBC and shut them down. FM 96 was the new kid on the block, they forgot about us when they planned the coup. When I arrived at the station there was no soldier in sight. I got Rabuka’s official statement that he had taken over the country to air and had a field day getting reactions. Emotional clips of Bavadra’s wife and relatives of other MP’s, Opposition sentiments to the coup. It was picked up by the wire service. The news had got out. It took the military four hours to realise people knew what was going on because they had tuned into FM96. 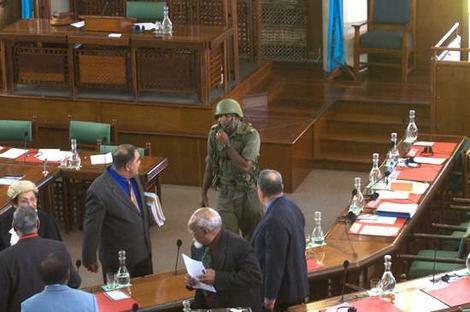 Top picture Dr Timoci Bavadra, second pic: Soldiers enter Fiji Senate in 2006. Photo by Wade Laube. Damn gud story if it did not hurt...but I remember the day and my unblief at the news. An Indo friend told me and I had mixed emotions. Rumbo started the rot and I guess it will never end for Viti untill or unless you scrape the now useless military. True. What a sad story for Fiji's military history - all the good works wasted because they couldn't rise above themselves and do what was good and right for the country - all they ever want to do was line their pockets with stolen money. Sam Thompson was lucky - in the present climate there would have been no journalists in sight for another coup - except Peter Lomas and the Fiji Sun, taking pictures and giving a pro-coup running commentary, cheering Frank and his band of soldiers! first editor was Dennis Rounds. Also apparently Francis Herman didn't have problems getting his newsroom to believe his report that there was a coup. According to another journalist around at the time, Francis was still on the phone with the then editor, George Williams when soldiers pointed a gun at him and ordered him to terminate the call. And wasn't there a third journalist in there with Thompson and Herman that day? I don't seemention of her in the Thompson story. I know the ten soldiers but it does not make any difference. They were merely tools or pawns in the overall scheme of things. The Captain has passed away but he will always be a friend. But do I condone the act? Never. As a Fijian I hate coups, in paticular those pulling the strings behind the scene. I am out of Viti but to those of my brethren still there...make up your minds now. Fight or drown. FM 96 may have been no 1 back then, not anymore with all the stupid drivel being broadcast by a band of amateurs. These present crop of presenters in FM 96couldn't hold a handle up to Sam Thompson and the like. some of the ten are still back there in fiji today.. Rabuka feared a couple of those men because they talk no nonsense..